Three ready-mixed producers in widely different parts of the U.S. demonstrate how concrete reclaimers support best environmental management practices. They tell Concrete Products why they purchased reclaimers, how they deal with yard problems, and what they see as benefits of the equipment. Interviewed were Robert Saia, director of sales for 711 Materials in Modesto, Calif.; Richard Haehl, executive vice president of Shelby Materials, Indianapolis, Ind. ; and, Lou Tobia Jr., vice president of American Redi-Mix, South Plainfield, N.J. All three make waste blocks or find other uses for returned concrete, and view putting large batches into the reclaimers as a last resort. None report any serious maintenance or performance problems, an indication that progress has been made over previous-generation reclaimer designs that were known for clogging, breakdowns, and poor separation of materials. Each producer confirms the reclaimer's role in keeping the yard clean. At more than one installation, the reclaimer is part of a larger solution that includes 100 percent containment of yard runoff. But what about payback? Producers who are not up against restrictive environmental regulations Û nor constrained by small lot size Û must balance the value of reclaimed aggregate, water savings, reduced trucking and waste disposal against the reclaimer's initial purchase and installation, maintenance, and electricity costs. For them, it comes down to focusing on running a clean operation, being seen as a good corporate citizen, and anticipating tighter regulations in the future. Family-owned American Redi-Mix serves customers in central and northern New Jersey with batch plants in Newark, South Plainfield and Tinton Falls. Founders Gerald and Lou Tobia Sr., who started out trucking sand and stone, got into the ready mix business with their first plant in Newark in 1991. Around 2000, they installed an Enviro-Port reclaimer in response to anticipated tighter environmental regulations and lack of space for dumping, storage and washout. In 2005, a Bibko 4000 reclaimer with 40 yards-per-hour capacity was installed at a new plant built on four acres in South Plainfield. The installation includes a 30,000-gal., aboveground tank for slurry water with four agitators to maintain fines in suspension. City water is piped in and automatically added when specific gravity in the tank exceeds set limits. Yard surface water drains into a pit and also can be drawn into the holding tank when fresh water is needed. The South Plainfield plant has a fleet of 15 trucks to deliver an average daily production of 200 to 300 cubic yards. 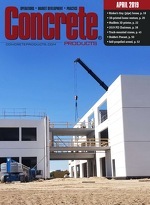 About five percent of concrete is returned, according to Vice President Lou Tobia Jr. Although the slurry tank is equipped with the optional Bibko heat/chill floor chamber, during a hot spell with temperatures in the 90s, Tobia decided not to circulate chilled water through the chamber in order to save electricity. This meant temporarily suspending the use of gray water in batching. In this hot weather, we are running the Bibko for washout only, he says. Returned concrete first goes into 2_2_6 forms, with blocks selling at $35 each. When all the forms are full, we dump it in strips onto a concrete slab and break it up, Tobia notes, adding he can sometimes go as long as three weeks without ribboning out concrete and hauling it to a quarry at a cost of $50 per load, although two loads per week is more typical. In cooler weather when returned concrete exceeds what can be absorbed by block forms, it is diverted to the reclaimer. Reclaimed aggregate is used in mix designs for customers other than the New Jersey Department of Transportation and New Jersey Turnpike, and Tobia finds the material savings partly offset the cost of electricity to run the reclaimer. A primary benefit, he says, is keeping the yard clean. You put your washout in [the reclaimer], and you don't have to dump slurry on the ground. Prior to having reclaimers, slurry was routinely dumped, dried out and trucked to a quarry. A loader operator spends approximately two hours a week in routine maintenance of the reclaimer, including power washing the rinse trays. Tobia says no special maintenance is necessary for fibrous mixes, and that the Bibko reclaimer has needed nothing other than routine maintenance in the five years since it was installed. A subsidiary of paving contractor George Reed, Inc., 711 Materials operates five ready mixed plants in the Stockton-Modesto market, three of which are equipped with reclaimers to control site water and accept returned concrete. The most recent reclaimer installation (in 2008) is a Bibko 2000 with 5-meter truck washout buffer at the company's new Modesto plant, which produces 80,000-100,000 yd./year from a five-acre site, and is served by 14 trucks. The reclaimer is Bibko's mid-sized model with the ability to process 20 cubic yards per hour. A similar installation at the Stockton facility was completed in 2005, five years after the company saw its first reclaimer delivered to the Oakdale plant. At the Modesto operation, a Noble 42,000-gal. expandable tank is used for above-grade storage of slurry water from the Bibko unit, with agitators to keep fines in suspension. A dedicated 500 GPM slurry pump guarantees sufficient water for production. A series of 7,000-gal. plastic tanks, plumbed in parallel, is used to store runoff water from the yard and provide water as needed by the Bibko system. A pavement ramp collects runoff which is then pumped to the holding tanks. The Stockton plant, new in 2005, was designed to guide all water within the production footprint towards the reclaimer. Stormwater is discharged into the municipal storm sewer system and is closely monitored for pH. At Modesto, we're self-contained, says Robert Saia, director of sales. All our process water used to be held in ponds, where we would dry the slimes out, and haul to a landfill. Since getting the Bibko we're able to handle all process water and rinse water and put it back into mixes. With temperature and slurry water and pH, it's a fine line, says Saia. One factor influencing use of water with cement fines is the customer's application. If a footing sets up faster, it's no big deal. A slab, on the other hand, is. Specific gravity is monitored closely, and the batch man adjusts the percentage of recycled water, which can be up to 70 percent. Amount of returned concrete going into the reclaimer can vary quite a bit, Saia explains. Sometimes full loads come back and we try not to put that [much material]in. It's more for the one- to three-yard returns. Alternative disposal arrangements include local cattle yards that keep forms ready for new stalls; a local concrete recycler who is happy to accept wet concrete onto a pile; and, several crushing sites within the parent George Reed company. Water savings have been significant. We have well water at two of the plants and city water at Stockton and Oakdale, Saia says. Savings are in the neighborhood of $300 to $400 a month. We probably cut 50 percent of our city water usage. The huge benefit is just being able to keep the site so much cleaner, he says, adding that bins for leftover concrete, wash water holding ponds, and slime from settled cement fines are eliminated. Drivers at 711 Materials have been trained to wash out the rinse pans with system water and keep the area clean. They know that all concrete residues coming out of the truck need to get into the Bibko, Saia says. The yard man just oversees them doing a good job. Staffers with responsibility for the reclaimers have learned to closely monitor all aspects of system operation. Our maintenance guy goes around to all locations and inspects everything once a week, says Saia. The Bibko units are designed to be self-cleaning, but have urethane wear pads. Maybe twice a year you're replacing paddles, he says. In the 42,000-gallon water tank, agitator paddles are monitored. We yank them up periodically and examine them. Those have to work; you have to keep things moving, Saia affirms. This 60-year-old, family-owned concrete and aggregates business Û based in Shelbyville, 25 miles southeast of Indianapolis Û began experimenting with reclaiming concrete in the 1980s at its Franklin plant. Today, Franklin is one of the company's eight ready mixed sites, with annual production of 300,000-400,000 yd., plus two aggregate mines. We were spending $40,000 to $50,000 a year just hauling off our waste stream at the Franklin plant alone, says Executive Vice President Richard Haehl, who guides the business along with his brother Philip Haehl, company president. It is in a very small footprint. In the 1990s, we began using a first-generation type of reclaimer, a glorified materials screw with settling pits for cement slurry. Sitting on four acres, Franklin has a fleet of nine trucks and annual production of 30,000 to 50,000 cubic yards. The cement slurry was a pain to handle, says Richard Haehl. A series of settling ponds was periodically mucked out with a front-end loader, and the material was piled, dried, and hauled off to a landfill. Feeling that the industry was headed towards requiring concrete reclaimers that also handle process water, the company put in Con-Rec reclaimers of Sandau design at Franklin and at a new plant in the Beech Grove section of metropolitan Indianapolis, both in 1999. The Beech Grove plant produces 60,000-80,000 yd./year and is served by 16 trucks. The units at Franklin and Beech Grove were undersized, says Haehl, prompting the addition of Bibko 5-meter buffers in 2005 to feed material into them at a steady rate. In 2009, the Con-Rec units were replaced with Bibko 4000 reclaimers of 40-cu.-yd./hour capacity. Although no longer needed to prevent overloading the reclaimers, Haehl decided to retain the buffers because they provide quicker turnaround by allowing four trucks to unload simultaneously. In 2003, a new plant with Bibko 4000 model was erected at Shelby's Clermont operation. At 13 acres, the Beech Grove location had sufficient size to accommodate conventional waste stream handling. However, since both it and Clermont are near the city of Indianapolis, a closed-loop waste system with reclaimers was deemed the best long-term solution. To handle surface water, a recirculating sand filtration system was designed for Beech Grove. Runoff from the large paved area flows to a concrete-lined catch basin, is filtered through sand, then pumped into a storage pit to be re-used in batching. The rationale for reclaimers at Shelby is partly economic, partly a display of corporate responsibility. They are fairly labor intensive, says Haehl, but with no reclaimer, there's a lot of work in dumping, breaking up, and hauling off the waste. While the company's three largest plants have reclaimers, the smaller rural plants hew to older methods. We still have a location using the old settling pond method, and several where we have a contained washout area in a gravel pit, he says. But, we really like our reclaimers, and in a metropolitan area, I'd do it again. Over the years, Shelby has developed mix designs that work well with gray water from the reclaimer and adhere to the ASTM C94 specification for concrete quality. Adding cementitious fines via reclaimed water adds strength, improves finishing characteristics, and speeds up set times. Shelby plays to those strengths. In winter, part of what we have done [to enable use of unheated reclaimed water] is to heat our sand, notes Haehl. That allows us to use less accelerator, at a savings to the customer. At each plant with a reclaimer, a yard man is assigned to clean the collection hoppers daily. On at least a weekly basis, my yard person pulls the holding tank pumps and power washes them, says Haehl. We have had issues with fiber in the past, and we do not put color[ed mix wash out] in the reclaimers. We put those in blocks, or windrow them out. A problem with previous reclaimers was sand buildup in the agitator pit. That is a thing of the past, says Haehl, as the Bibko units do a better job of sending sand into the recovered aggregate stream. With the slowdown in the economy, says maintenance manager Ronnie McKenney, we elected to close our Clermont plant for the winter in December 2009, and that was the first time we had cleaned those pits since the initial installation [of the Bibko] in March 2003.